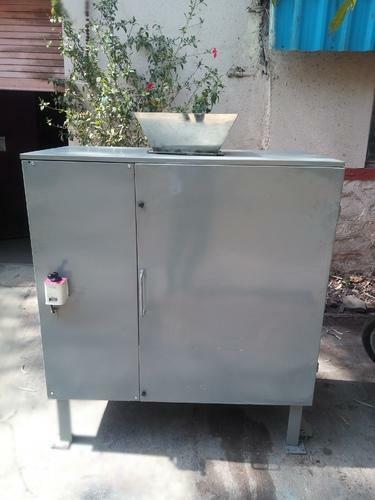 We are a leading Manufacturer of food waste compost machine from Nashik, India. Every day, HUGE amounts of food scraps (or even full meals!) are being wasted in India, taking up space in landfills and poisoning our Earth. Our technology has been applied in our comprehensive range of composters for use in any industry that produces food waste. Facility with a crushing chamber to deal with hard food waste and is ideal for composting all kinds of organics, including big animal bones, oysters and other crustacean shells. Loading of your organic waste and can handle large waste quantities, making it ideal for mid-sized restaurants, cafés and boutique hotels. During the recycling process, the food waste is mixed with the bulking agent inside the main chamber. The temperature is set above 60 degrees to get rid of bad bacteria contained in the food waste. This heating functions also as a dryer to remove the water content from the initial loading. Composting requires oxygen. Compost machine is equipped with a air-blower to ensure the material is well aerated inside the main chamber. Looking for “Food waste composite machine”?